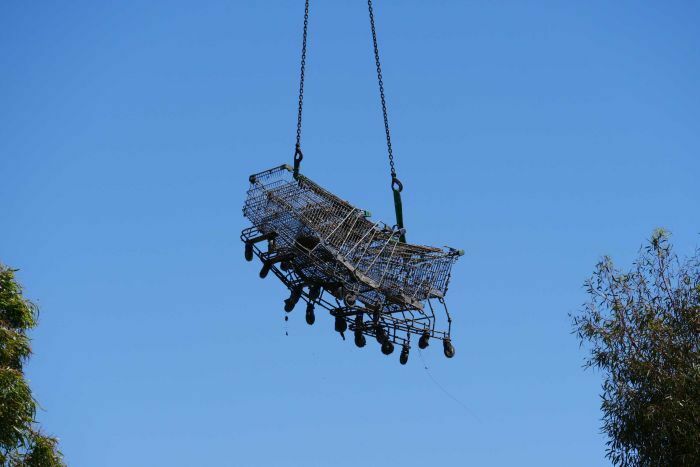 A regional council facing a massive bill after the removal of about 500 submerged shopping trolleys says it is willing to impose financial penalties if major retailers Woolworths and Coles don’t agree to fork out the bulk of the cost. 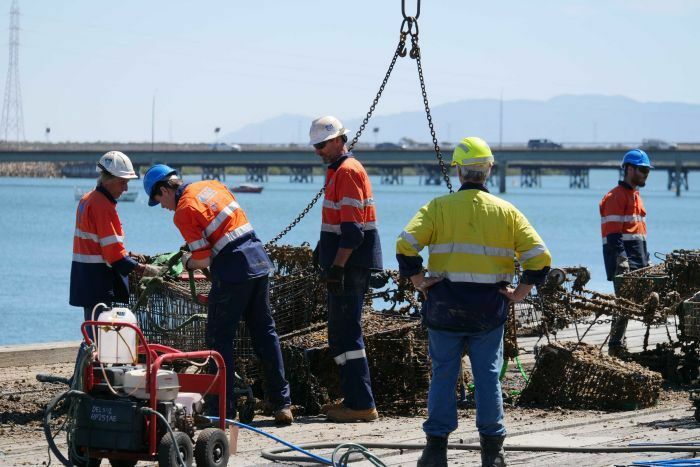 The Port Augusta City Council in South Australia’s north began removing the trolleys from the base of the local wharf in the Upper Spencer Gulf last year, amid longstanding concerns over community safety. It had issued notices warning locals not to jump from the wharf into the water because they risked “serious injury”. 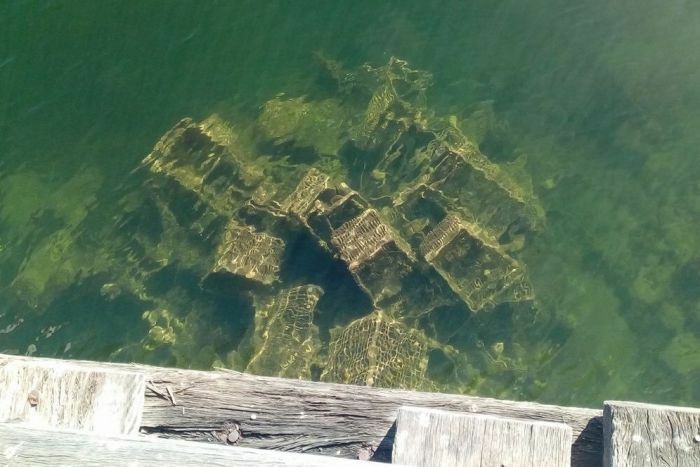 Some piles had reached up to six-metres-high prior to their removal, with trolleys able to be seen just beneath the surface of the water. The scale of the issue was identified during diving surveys of the area in July last year. The removal was expected to cost $15,000 with the bill to be jointly covered by the council and the city’s major supermarket chains Woolworths, Coles and Big W.
But a number of delays blew out the expected final cost to $40,000, with negotiations over the payment to begin this week. Port Augusta City Council’s city services director Melissa Kretschmer said if the stores chose not to pay the agreed amount, the council could act. “We do also have the option, which we’d ideally not have to go down, but we can actually fine these organisations for the illegal dumping of their goods,” she said. Under South Australian law, areas below the high-tide mark are considered the responsibility of the State Government. But Ms Kretschmer said it had already been agreed the city’s three major stores would cover 90 per cent of the removal cost, with the remainder to be covered by the council. She said the council had only recently received final invoices for the work and would now look to negotiate payment with retailers. “We now have to go back and ask for twice as much,” she said. “They’ve been very cooperative to date with their involvement in the project, so I remain hopeful that we will have a positive outcome. “We agreed to contribute 10 per cent because some of the items that were submerged weren’t shopping trolleys — it wasn’t all the property of the supermarkets”. The removal was initially delayed by a crane breakdown, before high winds forced the first retrieval to be abandoned late last year. 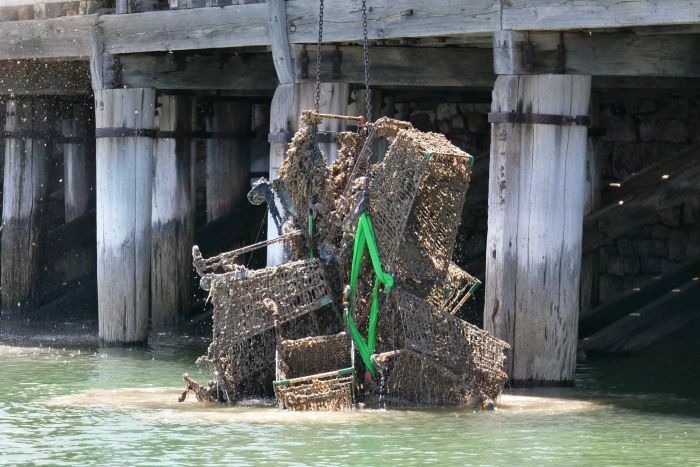 Initially, divers piled the trolleys on the seabed alongside the wharf, before they were connected underwater and hoisted ashore. Most of the trolleys were covered in barnacles and seaweed, but others were almost spotless, indicating the dumping by members of the public had been an ongoing issue. 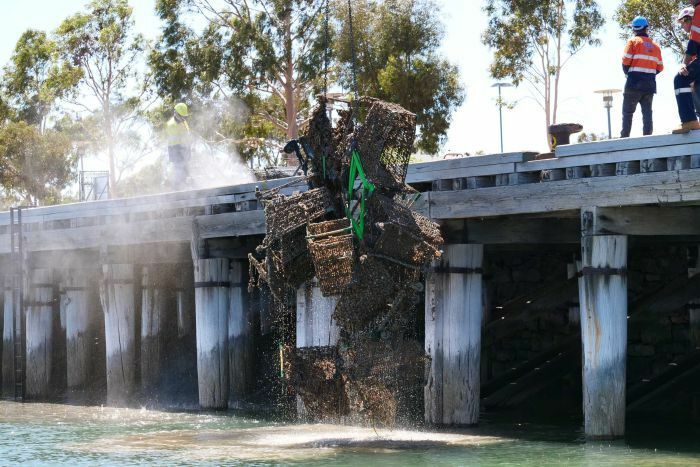 After the first contractor returned for another day’s work, the removal was completed by a second company contracted to demolish a jetty near the wharf this year. The remaining trolleys — about 250 — were retrieved from the water using a barge. “It’s doubled the cost because the second contractor spent an extra two-and-a-half days on site removing the trolleys and then transporting them off,” Ms Kretschmer said. Ms Kretschmer urged the public to keep their safety in mind and also consider the impact of their actions. “It is still illegal to jump off the wharf, it is shallow there at the best of times,” she said. “Keep in mind the overall impact on the community [of dumping trolleys]”. Coles and Woolworths declined to comment on whether they would still pay 90 per cent of the $40,000 cost. A Coles spokesperson said it had been proactive in installing wheel locks “on all trolleys at our store to limit their movement beyond the store perimeter”. A Woolworths Group spokesperson said it would “continue to invest heavily in regular trolley collection services”. “We have committed significant funding to help retrieve the submerged trolleys, so it’s disappointing to see the project hasn’t succeeded as yet,” the spokesperson said. Port Augusta is the most northerly city with ocean access in South Australia. Much of the city’s marine infrastructure faces an uncertain future, including its heritage-listed wharf, which has fallen into disrepair. Marine engineers estimate repair costs for the wharf at $11 million.